Place a large pot of water over high heat. You’ll use this to cook your noodles later. Place bacon in a cold frying pan. Then place over medium-high heat and wait for the bacon fat to render and for the bacon pieces to become crisp. Then remove the bacon pieces and set them aside for later. Keep the bacon fat in the pan. Place the pan back over a medium-high heat and place your dumplings to the hot fat. Cook for 2-3 minutes or until the dumpling bottoms are golden brown. Carefully pour in enough water to come halfway up the sides of the dumplings and cover the pan with a lid. Allow to steam for 4-5 minutes or until cooked through. In the meantime, your water should be boiling, so cook your noodles until just tender (check them just before the packet says they should be done). 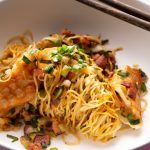 Over-cooking your noodles will make them harder to stir-fry! When the dumplings are cooked through, add the cooked noodles straight into the pan, along with the spring onions, garlic, ginger, soy sauces, sugar and vinegar. Toss until well combined. Remove from heat and toss through the sesame oil. Serve warm.